Not all cello is created equal. Nashville Wraps is thrilled to offer the best of the best: clear, strong cello bags that are biodegradable, too. Our NatureFlexTM Biodegradable Cello Bags are made from wood cellulose fibers sourced exclusively with sustainable forestry principles. These bags are certified biodegradable and compostable. This means that they have been proven to degrade 90% within 6 months. They are also certified as home compostable. They meet ASTM D6400 and EN13432 standards for California and other states. Another reason our biodegradable cello bags are eco-friendly is they are made “carbon zero.” This means the manufacturing process that produces them causes no increase in carbon released into the atmosphere. 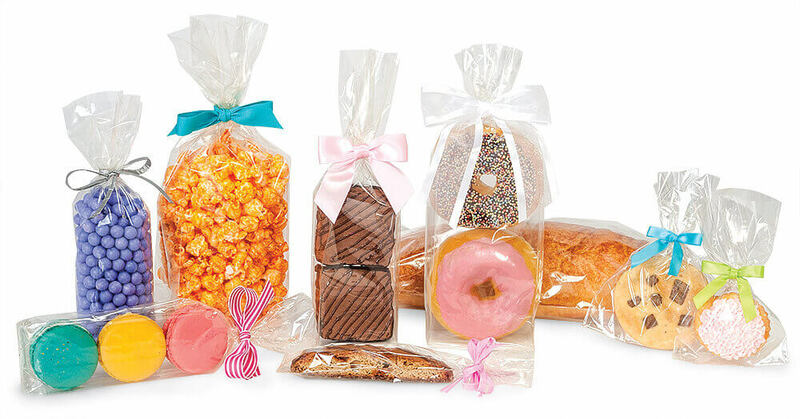 Nashville Wraps biodegradable cello bags comply with FDA regulations for food packaging, so they’re the perfect choice for packaging gourmet treats. They’re even heat sealable, with high oxygen barrier properties to keep food fresh. Best of all, they’re reasonably priced, available in many convenient sizes, and in stock now for quick shipping! Shop our biodegradable cello bags now! Choose 1.2 mil, 1.6 mil, or 1.6 mil with bottom inserts for all your gourmet and gift packaging needs! Azalea Matte Raffia • Pink Grosgrain Stripe Ribbon • Turquoise Grosgrain Ribbon • Silver Matte Paper Raffia • or choose another beautiful ribbon at NashvilleWraps.com!